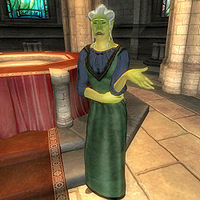 Orag gra-Bargol, an Orc priestess, is the resident Priestess of the Chapel of Stendarr in Chorrol. She sells Conjuration, Illusion and Restoration spells. When you first meet her, she will introduce herself briefly: "Blessings. I'm Orag gra-Bargol, servant of Stendarr. May you grow in the Faith." She sleeps from 2am to 8am in the Chapel Hall. The rest of the time she can be found upstairs, offering her services. Her attire consists of common middle-class clothing, including a blue & green outfit and a pair of quilted shoes. She also carries some extra tan linens, the key to the undercroft and a leveled amount of gold. Orag doesn't wield any weapons, choosing instead to rely on a series of spells from the Conjuration, Illusion, and Restoration schools of magic. These are the same spells that you can buy cheaply off her, as her Mercantile is a mere 5. Esta página foi modificada pela última vez à(s) 16h15min de 5 de maio de 2013.